Engagement in Online Courses - Center for Teaching and Learning | Learning House Inc. Enhancing engagement in the online classroom often focuses on instructional materials. Instructors often ask themselves questions like, how can the material be more exciting? Can material be chunked better? Can interactive lessons be developed? Are there any videos that can be used in place of written assignments? The three forms of engagement that can occur in online courses can overlap depending on the activity. So when searching for ways to make an online course more “engaging,” instructors should consider ways to enhance any of these three areas. In this article we’ll list some ideas on how you can meaningfully enhance opportunities for engagement in your online course that can be just as meaningful as most opportunities available to a face-to-face instructor. 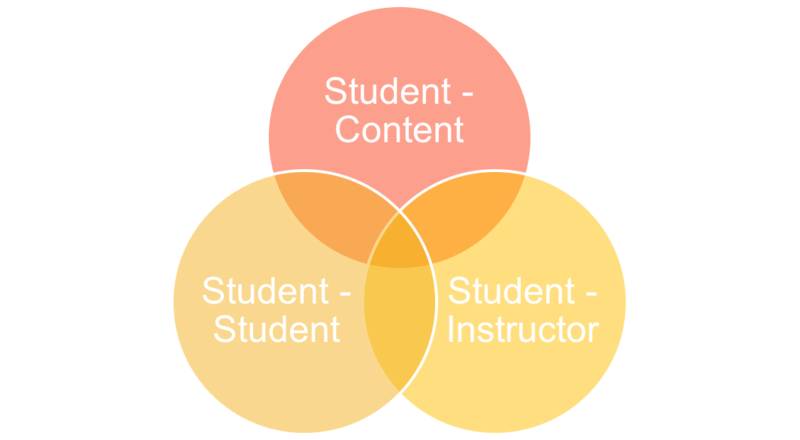 Content interaction includes any time students spend examining course content and participating in activities. Examining course content can be reading e-books, clicking through PowerPoint presentations, watching video lectures, and so on. Class activities include discussion forums, assessments, projects, and so on. Here are some strategies for encouraging students’ interaction with content. Present content in more than one format. If you present content primarily in one format (such as video, audio, or text), it requires all your students to learn in a format that may not meet their primary learning style. Provide a mixture of delivery formats to meet multiple learning styles, such as combining text lectures with video clips. Delivering content in multiple formats provides variety and eliminates monotony. Have students participate in online simulations. Simulations allow students to actively engage with the content. Locate existing simulations online or obtain them from publishers, or create your own using a variety of applications and software such as Camtasia or Adobe Captivate. Provide links to online resources that allow students to explore the topic in more depth. Links to Web-based materials allow students to browse and delve into content that interests them the most. They may use your links to branch off to other information sources. Use audio and video clips for access to guest lecturers and field experts. Use these clips to provide an expert perspective on the topic other than your own. Minimize the amount of instructor-generated content, and guide students into generating their own content. Use your students’ knowledge and experience to drive the content through the discussion forums, other communication tools you may use, and assignments they share with the class. Limit the content you provide to an overview that introduces the topic and puts it into context. Supplement it with Internet resources, simulations, and activities that engage the students. Create discussion forums that require students to reflect and build on the content. Students become actively engaged in the content through discussions about the materials you have provided. Write questions that require students to share their own perspectives and experiences to expand on the content provided. Assign activities that require students to interact with the content and explore the topic in greater detail. Simulations, Web searches, research reviews, and case studies all require students to interact with the content and learn more about the topic on their own. Use self-tests to allow students to check their understanding of content. Create self-tests for students to test their knowledge of key content concepts. Students will then know what they still need to master and can go back and review as necessary. Provide students with a list of questions they should be thinking about after they review the content. Encourage them to try answering the questions on their own. Keep the format of your lessons and modules consistent. Organize your content in a similar way for each instructional unit and use similar content formats. As the course proceeds, this makes it easier for students to organize the content for themselves, and it eliminates the need for them to adjust to a new delivery format for each lesson. Student interaction takes place anytime two or more students communicate. Among many other benefits, student interaction helps to create a sense of community, which encourages students to persist in the course, and it also gives students practice communicating and working with others remotely, which is a helpful skill for the changing workforce. However, this type of interaction doesn’t always happen naturally. Students may be shy or unsure how to communicate online, and even when students do interact, you may need to guide them to push the discussion deeper. Here are some tips for how to facilitate students’ interaction with one another. Encourage socializing in discussion forums. Encourage students to introduce themselves during the first week of the class. Ask them to provide information about their educational and work experiences and also some personal information. These introductions will help students find others who have similar backgrounds and interests and will also build a sense of community in the course. Provide a student-only discussion forum where students can discuss anything that interests them, even if it’s not related to the course. Encourage content-based conversation in discussion forums. Write discussion questions that are open-ended and invite students to relate their prior knowledge and work experience to the content. Students bring rich, diverse backgrounds to your course, and through well-designed discussions, students may learn more from each other than they do from the instructor. Assign students to take turns moderating the discussion forums. Assign students to moderate for a week, or ask them to sign up to moderate the discussion for a topic that interests them. Ask moderators to summarize the discussion at the end of the week. Require students to post certain assignments (e.g., short papers, journals, websites) so they are available to the entire class, and invite students to comment on each other’s work. When the assignment is likely to produce a variety of responses from students, having students post their work introduces students to new perspectives and can generate lively discussion. Set the expectation that students must be respectful when commenting on others’ work. Without this assurance, some students may not feel comfortable sharing their work with the entire class. Encourage students to use synchronous tools for group meetings. Students can meet on a scheduled or ad hoc basis to discuss group projects, content, assignments, and so on. Depending on the parameters of the assignment, you could allow students to use more informal synchronous tools such as Skype or Google Hangouts, or more formal tools such as Adobe Connect, Zoom, or WebEx. Assign group work. Assign group work when group work will help students achieve a learning objective. For example, if an issue in your course might come up as a team project in the workforce, assign a group project to simulate the workplace experience. Case studies that may require discussion and different perspectives lend themselves well to group work. Provide discussion forums for each group. Your interaction with students should focus on reinforcing understanding and providing feedback. To be effective in an online format, you must maintain a supportive presence and offer timely feedback and personalized contact with students. Below are some strategies for successful interaction with students. Present a welcoming, friendly atmosphere. Introduce yourself at the beginning of the course. In addition to your academic background, post some personal items to give students a sense that you are approachable. Post a picture of yourself to give them a face to identify with. Don’t be afraid to let your personality show when you are responding in the discussion forums or to e-mails. Use students’ names when you respond to their e-mails and discussion forum posts. Write in the first person, using “I” when you respond. Provide more than one way for students to contact you. Provide more than one way for students to contact you so they can use the option that is most comfortable for them. For example, provide your e-mail address and your office phone number with office hours. Respond to students as soon as possible, ideally within 24 hours. Provide clear and thorough information to students. Make sure your syllabus thoroughly describes how the course works and your expectations for students. Provide a list addressing the most frequently asked questions you anticipate students having about the course. Thoroughly describe each assignment and the grading criteria. Although online education often conjures an image of a student sitting on his or her computer alone, interaction is a central component of the online learning experience, and interaction is the core of engagement. As an instructor, you can provide meaningful methods for students interact with the content, each other, and you to help them meet their learning goals. To set your students up for success, provide them with a variety of learning methods and materials, opportunities to work with each other, and personal feedback and contact with you. Such interactions will make your subject matter much more engaging than words and images on a screen.